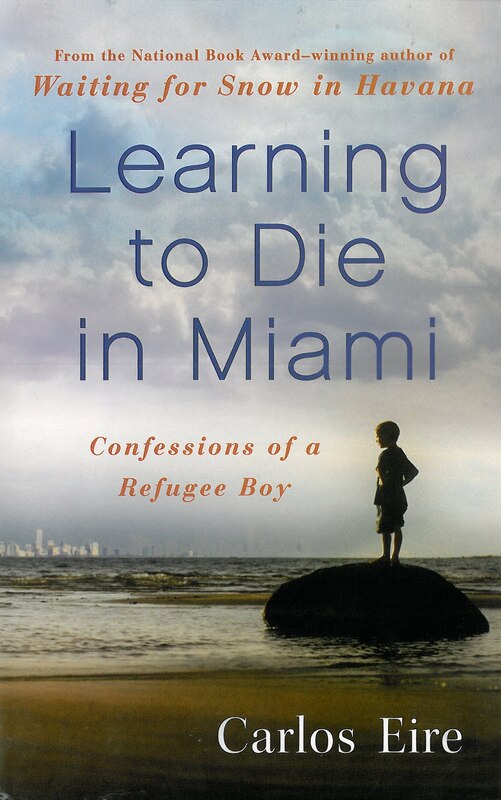 This weekend I finished Learning to Die in Miami, (2010) by Carlos Eire. This is the follow up memoir to Waiting for Snow in Havana, published in 2003, which told the story of Eire’s childhood in Havana, Cuba. Born there in 1950, Eire grew up with his older brother Tony and his parents, whom he refers to as Louis XVI and Marie Antoinette (due, apparently, to his father’s belief that he was the reincarnation of the beheaded king of France). The book ends when he and his brother are evacuated from Cuba in 1962 as part of Operation Peter Pan. After seven years, in Learning to Die in Miami Eire brings us back to that moment when he and his brother landed in Florida. As you can probably imagine, this is not a light, easy read. Already in Waiting for Snow in Havana, you know that the seeds of heartbreak are sewn in his family. His father is distant and unable to express his affection. He adopts Ernesto into the family, but is blind to his abusive behavior. Learning to Die in Miami takes us through the many deaths of Carlos, Charles, Chuck and Charlie. Eire writes with heart-wrenching eloquence about a young boy’s fear of total loneliness (the Void, as he calls it), and his desperate desire to let his past die and fully become an American boy. We learn of his brother Tony’s distancing behind a wall of isolation and his descent into an unescapable abyss. He examines his father’s motives behind his choices, and his mother’s unceasing efforts to follow her sons out of Cuba. Though while he touches on the flaws and failures of his family, Eire does not spend his memoir witnessing for the sins of others. Nor does he assign blame to anyone or write about them as anything other than entirely human. What is most captivating to me about this memoir is how Eire seems to step outside of himself to look back in. He uses language that makes him seem apart from his experiences in order to make us understand, but at the same time he does not remove his feelings, his reactions or his fears from them. I am also fascinated by his clinging to spirituality, despite the horrors of an abusive foster home, and constant abandonment by people he comes to trust. It is this spirituality, and his coming to believe in an unending source of grace, which give this memoir an edge of humor and of hope. It would be dangerous to say more, for fear of giving too much away. If you haven’t read Waiting for Snow in Havana, I highly recommend picking it up, especially as a vehicle towards Learning to Die in Miami. Carlos Eire’s memoirs are heartbreaking yet life, faith, and family-affirming. Reading them will take you out of your comfort zone and challenge you to see the world through the eyes of a boy whose life’s path has most likely been so unlike your own. But it will not seem unfamiliar. Can I Be Friends with Joseph Gordon-Levitt?